The forestry, sawmilling and pulp and paper manufacture infrastructure in New Zealand is well positioned to support biorefineries. Power, fuel, fibre and value-added chemicals can all be produced from biomass. 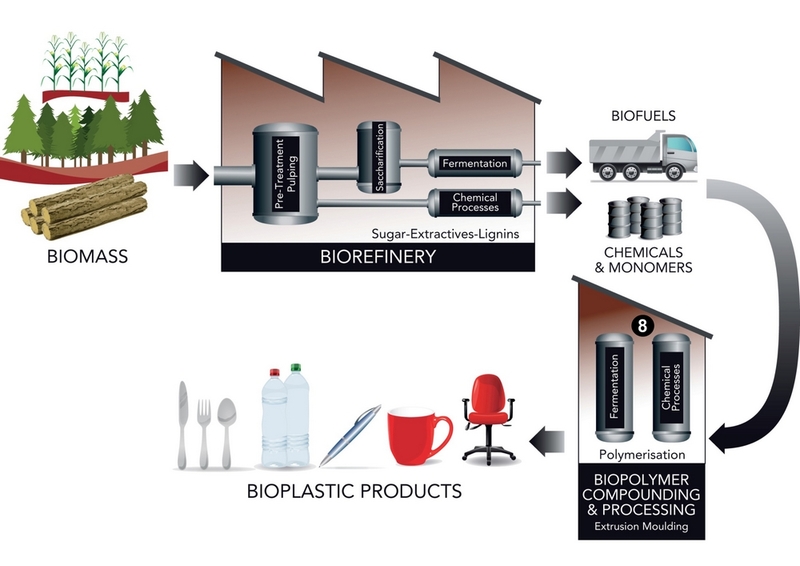 Scion’s bioenergy research, along with other work looking at biopolymers, biochemicals and extractives, are making biorefining a reality. Clustering industries near one another, and near renewable raw materials and energy resources, encourages industrial symbiosis where the wastes or byproducts of one company become the raw materials for another. Acting co-operatively, operating costs can be reduced and new business and job opportunities created. Scion is quantifying opportunities for greater industrial symbiosis utilising geothermal energy and wood processing capabilities in the central North Island. Industrial symbiosis in Kawerau in New Zealand’s Bay of Plenty takes advantage of nearby planted forests, geothermal energy, and its proximity to the Port of Tauranga (and Scion). These regions are forecast to have a long-term supply of surplus logs, forestry and other woody waste. Greenfield opportunities for wood processing in these regions were identified using maps of forestry resources and heat demands, the Biomass Supply Model to estimate wood and harvest residue supply and the WoodScape model to calculate return on capital investment. Opportunities for wood processing with clustered with other industries to reduce waste and greenhouse gas emissions, create jobs and contribute to New Zealand’s bottom line are substantial in each of the four regions. Opportunities for further industrial symbiosis in New Zealand have been identified by looking at forestry and energy resources, and wood processing and other industry region by region. The results are shown in a series of maps. Full industrial symbiosis around the Marsden Point oil refinery and Golden Bay Cement/Portland in Northland warrant further investigation. There are also opportunities to replace fossil fuels with biomass in Blenheim, Nelson, Hokitika, Greymouth and Canterbury.